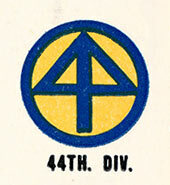 The 44th Infantry Division landed in France via Cherbourg, 15 September 1944, and trained for a month before entering combat, 18 October 1944, when it relieved the 79th Division in the vicinity of Foret de Parroy, east of Luneville, France, to take part in the Seventh Army drive to secure several passes in the Vosges Mountains. Within 6 days, the Division was hit by a heavy German counterattack, 25-26 October. The attack was repulsed and the 44th continued its active defense. On 13 November 1944, it jumped off in an attack northeast, forcing a passage through the Vosges Mountains east of Leintrey to Dossenheim, took Avricourt, 17 November, and pushed on to liberate Strasbourg, along with the 2d French Armored Division. After regrouping, the Division returned to the attack, taking Ratzwiller and entering the Ensemble de Bitche in the Maginot Line. Fort Simserhof fell 19 December. Displacing to defensive positions east of Sarreguemines, 21-23 December, the 44th threw back three attempted crossings by the enemy of the Blies River. An aggressive defense of the Sarreguemines area was continued throughout February 1945 and most of March. Moving across the Rhine at Worms, 26 March, in the wake of the 3d Division, the 44th relieved the 3d, 26-27 March, and crossed the Neckar River to attack and capture Mannheim, 28-29 March. Shifting to the west bank of the Main, the Division crossed that river at Grosse Auheim in early April, and engaged in a 3-week training period. Attacking 18 April, after the 10th Armored Division, the 44th took Ehingen, 23 April, crossed the Danube, and attacking southeast, took Fussen, Berg, and Wertach, in a drive on Imst. Pursuing the disintegrating enemy through Fern Pass and into Inn Valley, the 44th set up its CP at Imst, Austria, on 4 May. Landeck surrendered on the 5th. Meanwhile, the 19th German Army had surrendered at Innsbruck, and the war was over for the 44th. After a short period of occupation duty, the Division returned to .the United States in July 1945 for retraining prior to redeployment, but the end of the Pacific war resulted in inactivation in November.